American IFMGA guides John & Olivia Race organize all of the Northwest Mountain School's trips in the European Alps. 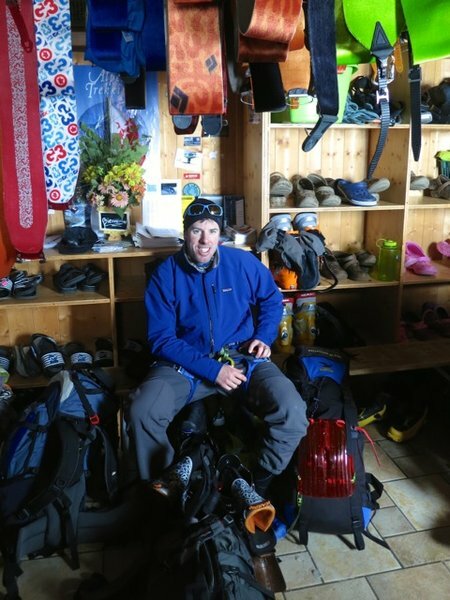 These programs complement our US based programs as they allow our customers the opportunity to tour from hut to hut with light packs in some of the most famous and spectacular ski terrain in the world. Most of our customers are familiar with the Haute Route, perhaps the most famous ski tour in the world. If you have not skied in the Alps, this is a good place to begin. Return customers or those more familiar with European ski touring will quickly recognize the opportunity to be had on some of our other tours. All tours are led by IFMGA guides, a legal requirement for those guiding in Europe. We take care of all reservations and work with you to arrive well-prepared and equipped for your tour. If this is your first tour you will want to have some training in Alpine Touring (AT Skiing). We are happy to provide this training or to recommend a guide that lives closer to your home ski area. Prior to offering any tour we send a group of guides to scout the area, find the best skiing, dial in the logistics, and put together route plans that allow us to move in poor weather or poor visibility. Haute Route literally means high road and is the tour that runs from Chamonix, France to Zermatt, Switzerland, the two most important centers of alpine climbing in Europe. Rich in climbing and skiing history, this point to point tour takes 6-days and generally starts in Chamonix, France. We run this as a 7-day tour allowing 1 day to prep the group by skiing the Vallee Blanche from high above Chamonix followed by 6 days of touring to the Trient, Month Fort, Prafleuri, Dix and Vignettes Hut. The nearest airport in Geneva (GVA) a short 1 hour shuttle ride to the hotel we use in Chamonix at the start of the trip. At the end of your trip, all luggage is shuttled to Zermatt allowing you to return directly to the airport for the trip home. The tour can be done when the huts open in mid-March, and generally is viable through the end of April. Trips run later in April may require significant hiking in the valley bottoms. 7-days, $2745 per skier. No section of the tour is overly technical, but there are sections that we must pass through that require the use of rope and crampons. This trip is located in the Tyrol region of the Austrian Alps. It is possible to do a lengthy point-to-point tour in the Silvretta, but we have boiled the tour down to the 3 best huts allowing us to maximize our time spent touring above the huts, rather than touring to reach the next hut. The season for the Silvretta starts earlier and finishes earlier than our other tours. The best season in late February through mid-March. We utilize the Heidelberger, Jamtal, and Wiesbadner Huts. The trip starts and ends in Galtur, Austria which is closest to the airport in Innsbruck, Austria (INN), just over an hour by car or 3 hours by public transport. This tour seems relatively unknown outside the German and Austrian ski community. The huts on the Silvretta tour tend to much nicer than any other tour that we run with the exception of the Ortler Ski Circuit. The snowpack here is shallower, but also tends to hold powder long after the last storm. The ski terrain can be adjusted to accommodate newer skiers or dialed up for those looking to ski more challenging terrain. This is a 6-day tour that costs $2295 per skier. The Berner starts and ends in Interlaken, Switzerland. Situated in the high mountains behind the Eiger, this area has the largest glaciers of any area that we tour. The Berner tends to be a bit of a weather magnet, which can increase the possibility of both great snow and big storms. We reach the ski terrain at the start of the trip by taking a cog-rail train to over 12,000 feet at the Jungfraujoch. On this tour we generally stay at the Hollandia, Finsteraarhorn, Konkordia, and Oberaarjoch Huts. If the weather deteriorates we will enter and exit via the Jungfraujoch, but on most tours we enter via the Jungfraujoch and exit via the big valleys leading to Munster, Switzerland and then take a short train ride back to Interlaken. This trip seems to remain viable longer into Spring than any of our other tours and is an excellent option for late April when the other areas can start to run short on snow. The huts are probably the simplest of all the huts we utilize due to their very remote location and the fact that they must all be resupplied by helicopter. This is a 6-day tour that costs $2295 per skier. Many of our customers have done all or most of the tours we offer and this consistently rates as a favorite. There is no airport close to the Ortler, so most participants share in renting cars from the airports in Milan, Zurich, or Geneva. The Ortler was a contested border between Austria and Italy during WWI and many of the remnants of these battles remain along the high ridges in the form of barbed wire, massive cannons, and concrete gun placements. We utilize the Branca, Pizzini, Marteller, and Schaubach Huts. All of these huts are in Italy and run by Italians and the food is first-rate. Unlike places like the Berner, the huts all have hot showers, espresso machines, and beer on tap. The skiing seems to be best from around mid-March through early April. The trip follows a circuit that touches the edges of the region. This is one of the few areas where we can actually ski off the summit of many peaks just under 4000 meters. The way the huts are situated, this is a good spot to allow for a portion of the group to get in a good ski in the first half of the day and then rest in the afternoon while the more energetic crowd can get out for afternoon tours. This is a 6-day tour that costs $2295 per skier. Hochjoch and Vernagt Huts. This tours gives people the change to summit peaks like the Wildspitze, Weisskugle, & the Finailspitz. Perhaps most interesting, this is the area where hikers found Ötzi, the Iceman, a 5300 hundred year old hunters whose remains melted out of the glacier in 1991. Like the Silvretta, the huts in Austria are more like small hotels with hot showers, semi-private rooms, and very good food. This trip works best from early March into mid-April. This is a 6-day tour that costs $2295 per skier. This originally came to us via Nick Pope, but has long been a great resource for people looking to summit a great 4000 meter peak in Italy a few hours drive from the ski mecca of Chamonix, France. 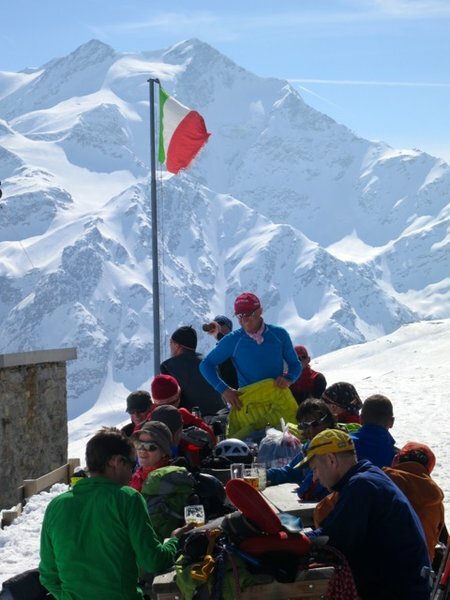 This trip combines great ski terrain and Italian hospitality as you make your way through one if Italy's most famous National Parks. The trip culminates with a summit of Gran Paradiso and starts and ends in Chamonix, France to make it easier for people to get to and from the course start via the international airport in Geneva, Switzerland, a short 1-hour shuttle ride away. The entire group will be transported to and from Gran Paradiso at the start and end of the trip. If you have spent any time in the mountains around Chamonix you have gazed at the beautiful mountain to the southwest that towers over surrounding peaks. This area is much quieter and more remote feeling than many of the other places where we tour in Europe and is a real gem. This is a 6-day trip and costs $2295 per skier. The Urner is our newest tour and we are wondering why it took us so long to discover this gem. 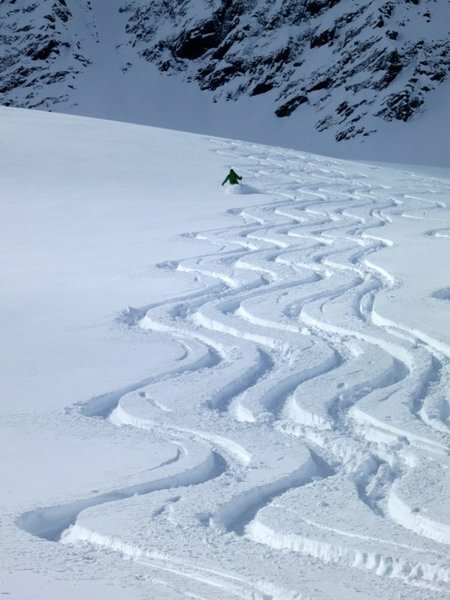 The tour traverses from the two off-piste paradises of Andermatt, Switzerland and Engelberg, Switzerland. 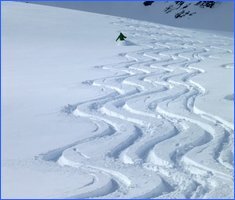 The area up valley from Andermatt is the starting point of a variety of long backcountry tours in a part of Switzerland where all of the main passes are closed in the winter. The trip has a couple of mandatory long days (up to 4500' of climbing) but this is balanced out by multiple descents in excess of 5000'. We scouted the trip twice in 2018 and realized that this works best in April as you are more likely to have sufficient stability to get through a couple of critical sections. We feel like the likelihood of not completing the entire tour due to snow conditions is a bit higher than some of our other trips, but this simply gives us more time to ski off-piste at either end. The ski terrain in Engelberg was probably the best lift accessed skiing we have experienced to date in Europe , outside La Grave, France, which is a bit more extreme. Access is very easy from Zurich airport. This is a 6-day trip and costs $2295 per skier. If you have any questions, please give our office a call at 509-548-5823 to discuss any details of our European ski tours. We are also happy to provide references. as well as IFMGA Licensed Guides.